Nigerian rapper, Olamide just shared photos from his trip to Disneyland with his son, Batifeori Maximilliano Adedeji. He captioned it, ‘somehow found myself in Disneyland with my hitta’. Olamide Adedeji, known by his stage name Olamide but famously known as Olamide Baddo or BaddoSneh, is a Nigerian hip hop recording artist. He records most of his songs in Yoruba, which is his native tongue. His very cute son Batifeori Maximilliano Adedeji, was born on 30th January 2016 in St. Ives Hospital in Lagos. 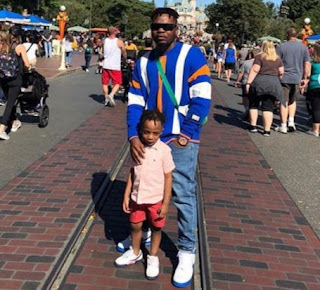 This is the first child of Olamide and his long time girlfriend, Aisha Suleiman.